CEO Satya Nadella announced the new "AI for Accessibility" effort as he kicked off Microsoft's annual conference for software developers. 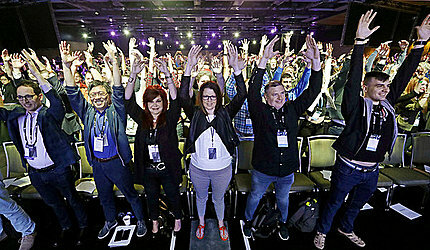 The Build conference in Seattle is meant to foster enthusiasm for the company's latest ventures in cloud computing, artificial intelligence, internet-connected devices and virtual reality. In unusually serious terms for a tech conference keynote, Nadella name-checked the dystopian fiction of George Orwell and Aldous Huxley, declared that "privacy is a human right" and warned of the dangers of building new technology without ethical principles in mind. "We should be asking not only what computers can do, but what computers should do," Nadella said. "That time has come." "It may be an accessibility need relating to vision or deafness or to something like autism or dyslexia," Smith said in an interview. "There are about a billion people on the planet who have some kind of disability, either permanent or temporary." Those people already have "huge potential," he said, but "technology can help them accomplish even more." Microsoft has already experimented with its own accessibility tools, such as a "Seeing AI" free smartphone app using computer vision and narration to help people navigate if they're blind or have low vision. Nadella introduced the app at a previous Build conference. Microsoft's translation tool also provides deaf users with real-time captioning of conversations. "People with disabilities are often overlooked when it comes to technology advances, but Microsoft sees this as a key area to address concerns over the technology and compete against Google, Amazon and IBM," said Nick McQuire, an analyst at CCS Insight. Smith acknowledged that other firms, especially Apple and Google, have also spent years doing important work on accessibility. He said Microsoft's accessibility fund builds on the model of the company's AI for Earth initiative, which launched last year to jumpstart projects combating climate change and other environmental problems. Other announcements at the Build conference include partnerships with drone company DJI and chipmaker Qualcomm. More than 6,000 people are registered to attend, most of them developers who build apps for Microsoft's products. Facebook had its F8 developers' gathering last week. Google's I/O conference begins Tuesday. Apple's takes place in early June.